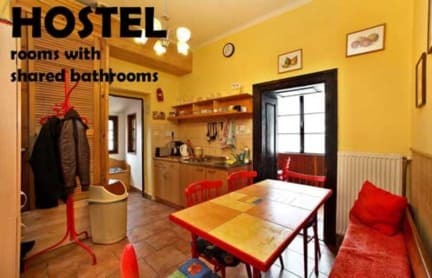 This cozy hostel, located in a romantic building in the historic town center (2 min. from the town square, 5 min. from the castle), sits right on the bank of the Vltava River near the municipal park. Ensuite rooms and apartments are in the pension building, located in a quite little street Horska, 300 m from the hostel. Our guests enjoy the privacy of the comfortable rooms combined with a relaxed and friendly home atmosphere as well as common rooms, games, darts, and more. You can even relax on the river bank or our balcony. The hostel offers 3 fully equipped KITCHENS (coffee and tea on us), 5 bathrooms and WC, hot water 24 hours a day and central heating. Pension building has all rooms with private bathrooms and 1 guest kitchen with utensils (apartments have private kitchens). INTERNET (PC and WI-FI) for your FREE use both in the hostel and the pension building!! FREE tea, coffee, sugar and cream all day long! The hostel offers 4 FREE PARKING SPOTS by the building (free parking is usually available, but is not guaranteed, unless you reserve it in advance via email). Arrangement of horse-riding tours and boat rents, FREE skates in winter, innertubes in summer!! Double rooms ensuite and apartments are located at PENSION Merlin, Horska street, a different building then the hostel.